On 6th June, Ji Xuecheng, the president of CNAICO and Peng mingjing, vice secretary of party committee visited to UIAC and had a friendly talk with all staff. 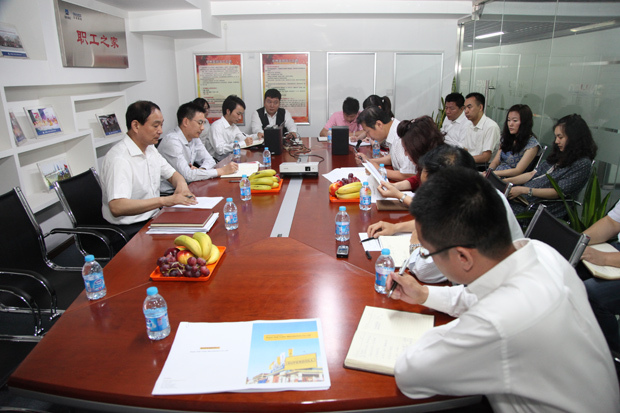 The general manager, Ren Wei, the vice-general manager, Li Zhongxiao and the general manager assistant, Zhao Hong reported the business operation and the process of projects. After the report, the president Ji Xuecheng agreed with the planned position and future of UIAC. He pointed, UIAC should find their own position in the market, and build the core competence to stand out based on the three fields including exhibition service, demonstration and advertisement agent. He indicated that the company has to improve the service by three ways including professionalization and standardization, in-depth understanding of requirements and character of services, and the quality improvement of service. In the meanwhile, he thanks to the efforts and responsibility of all staff. Moreover, the president emphasized the development of UIAC based on efforts from every one. Every staff should take their own responsibilities to work hard. Finally, Peng concluded that everyone should do their best to be employee of ‘Luo Wen’.